The Hobbit: An Unexpected Journey is a 2012 epic fantasy adventure movie directed by Peter Jackson. It is the first part of a three-part film adaptation of the 1937 novel: The Hobbit by J.R.R. Tolkien. Another two parts are The Desolation of Smaug (2013) and There and Back Again (2014). The three films together will act as prequels to Peter Jackson’s The Lord of the Rings, which is originally a sequel to the novel. And characters of The Lord of the Rings will be in The Hobbit, too. The story is set in Middle-earth sixty years before The Lord of the Rings. An Unexpected Journey tells of the hobbit: Bilbo Baggins (Martin Freeman), who is convinced by the wizard Gandalf (Ian Mackellen) to accompany thirteen dwarves on a quest across middle-earth to reclaim the Lonely Mountain from Smaug the dragon. The movie was released internationally on 14th December 2012 and has earned great box office (the sixth highest-grossing film of 2012). Wonder how to copy The Hobbit to hard drive or watch it on portable devices when DVD is released? Download Any DVD Cloner Platinum to copy The Hobbit: An Unexpected Journey DVD on hard drive/DVD, convert the movie DVD to videos for playback on mobile devices with a few clicks. Audience will see actors from The Lord of the Rings appear in the movie. Ian Mckellen, Andy Sekis, Ian Holm, Hugo Weaving will reprise their roles. Actors like Cate Blanchett, Christopher lee, Elijah Wood and Orlando Bloom return for the production even though they did not appear in the novel. How to copy The Hobbit: An Unexpected Journey DVD? 2. Insert The Hobbit DVD into DVD drive, then launch the program. Click "Open DVD" to load movie titles in the program. 4. Choose the same DVD drive to "Source". 5. Click "Start" to copy DVD. Wait for a while and the copying process completes, then the drive will be ejected and asked you to insert blank DVD disc. Please insert a blank DVD disc and click "Retry" to continue the burning process. You may wonder how Any DVD Cloner Platinum make The Hobbit DVD to video. Actually, it is very simple, just convert the DVD content from the disc to video format that supported by your potable device. And MP4 is the most widely used video format. Then go to "DVD Ripper", then choose the output option/portable device you have. You can change output video file format in "Output Format". Click "Start" button to start ripping. Wait for a while, the video file will be generated. Transfer the vidoe file to your mobile phones or tablets, then you can watch The Hobbit movie as well as other protected movie DVDs on the way. It is free and very convenient. 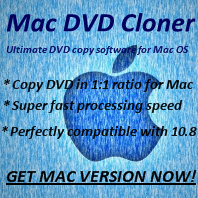 The processing speed of Any DVD Cloner Platinum for copying or rippping is super fast, no need to worry about coyping or converting this classic and amazing movie would cost you too much time.